The following essay appeared in VISUAL, the catalogue that celebrated the opening of VISUAL, Centre for Contemporary Art, Carlow, Ireland, 2009. 1. The duration of the performance will be six hours. The artist must be present in the space for the duration of that time. 2. The ‘trail’ of the performance activity will be left behind. 3. Each artist will perform amid the detritus of the previous performances. 4. Documentary footage of each performance will be taken and shown post performance. 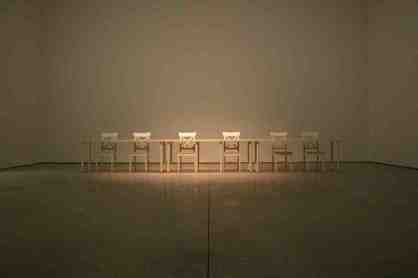 The exhibition space started empty with a simple long white table and six white chairs. Three projections played, showing previous performance work from each of the artists and the documentary footage of the live performances. These projectors were turned off during the live performances. Accumulator is a Performance Art exhibition, a conversation between six artists and their audience. The exhibition has at its core the live durational performance. Over the course of the first two months of the exhibition’s run it was in flux; shifting and changing as each artist created their performance. The exhibition was ‘finished’ when the last artists had performed and the footage of his performance was edited and projected large scale onto the wall of Visual’s digital room. Performance Art is a slippery term. In contemporary art practice video work is sometimes referred to as performance, experimental theatre and dance also come under the umbrella of performance art. What kind of performance practice to choose was a pertinent question for me as the curator. Performance in the Visual Arts narrows the field of choice somewhat but within this remit there is also a plethora of practices. The Performance Art that engages me is one where the artist is the performer and works durationally. This type of practice may be defined as one where the Artist is present in a certain place, for a certain amount of time, communicating with the audience and the lenght of time should be substantial. The artist’s included in Accumulator range from the Father of Irish Performance Art; Alastair Mac Lennan to the younger generation of practioners such as Declan Rooney. The politically charged yet gentle practice of Brian Connolly intersected with Neva Elliott’s relational practice, engaging directly with the audience to make a participatory performance event. Declan Rooney, Yingmei Duan and myself have all made post graduate studies with Marina Abramovic and are in the vanguard of the second wave of Performance Art currently showing internationally. This exhibition appears at a time in the Art World where performance practice is coming from the edges into the gallery canon. New York’s MOMA this year appointed their first Curator in Chief for Performance Art and the Whitworth Gallery in Manchester cleared out its collection and installed 14 durational performance for three weeks this July. Live performance practice now has options beyond the event that enlivens an exhibition opening. Durational performance is the dynamic element to this exhibition. All of the artists were asked to be present in the gallery for six hours. This time is substantial. It has transformative power over the work. The distinction made for live durational performances in the visual arts, living installations, is that they are un-rehearsable and un-repeatable. A practioner may try out, practice and reconfigure a new piece in their studio. It is not until the live event and the added elements of site and audience that the piece can be made in that unique configuration. The element of chance is the explosive constituent in duration and we Irish people love chance. We have a special relationship and enthusiasm for all things live, from sport, to music, to storytelling and it is in this cultural context that Ireland has developed a vibrant and outstanding practice in performance art making. The choice of the six-hour duration gives room for the actions to develop autonomously outside of the artist’s dictate. The artist comes to a performance with a plan. But, it is with the length of time, attending, being in the here and now, that the artist’s ego is superceded by the work. A purity and clarity becomes apparent and the work sings. Live Performance in the Visual Arts is a unique and ephemeral medium and brings with it that excitement and freshness for the viewing public. This notion of the work taking over is not an indulgent artist-centric concern. As the clarity of the piece becomes more apparent over the duration, the intensity of communication with the audience heightens and the power of the work soars. This is a cyclical exchange between audience and performer. The artist offers a live image, the audience engages, the work becomes more powerful. The audience is the second performer. By their presence, their attention and their eye gaze they activate a loop of communication with the performer, assisting and allowing the performance to continue. Accumulator is the first time such an exhibition was seen in Ireland, showing a substantial body of live work presented over the normal length of an exhibition in an innovative way. As such it was an ambitious one for a new centre of contemporary art to host. Because of the process basis of the exhibition it’s management and logistics were demanding. The exhibition was in flux for two months and its production was a truly collaborative one. Klaus Biesenbach is Chief Curator of MOMA’s Department of Media and Performance Art, this Department was broadened in 2009 to include Performance Art to as their press release states ‘reflect the Museum’s increased focus on collecting, preserving and exhibiting performance art’ This exhibition for the Manchester International Festival 2009 Marina Abramovic presents... curated by Hans-Ulrich Obrist, Marina Abramovic and Maria Balshaw. Amanda Coogan, Yingmei Duan and Alastair Mac Lennan were exhibiting artists. Interestingly, from the 14 international artists included in Marina Abramovic Presents... at the Whitworth Gallery three of them were Irish or live on the island; Alastair Mac Lennan, Kira O’Reilly and Amanda Coogan.